Hi, I recently saw this amazing painting of an orchid in an art gallery at my hometown. It was done in acrylic and the background had this aged, cracked look in brown. Thing is, the painting seemed mostly smooth and it wasn't a print while the orchid itself looked almost like a pastel painting. Any tips on how to achieve such an effect? The aged, cracked look can indeed be quite stunning in acrylic paintings. That vintage, weathered appearance adds a little something extra, lending the piece a sense of history and mystery. To achieve an aged, cracked look with your paintings, you can use mediums such as Golden Crackle Paste, Jo Sonja's Crackle Medium, DecoArt Weathered Crackling Medium, or Reeves Crackle Spray. 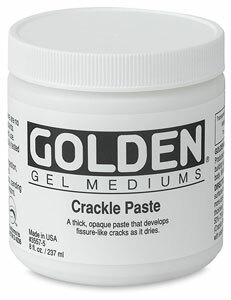 The medium I'd most recommend is Golden Crackle Paste, because Golden is well-known for creating professional-quality artist products. The paste will shrink as it dries, so it is best to use a rigid support such as wood panels, rather than canvas, which might warp as the crackle paste dries. If you really want to use canvas though, be sure to use stretched canvas rather than unstretched canvas. Whichever support you use, whether canvas or wood, be sure to prime the support with 1-2 coats of gesso. This is essential for allowing the Golden Crackle Paste to adhere well to your chosen surface. Using Golden Crackle Paste is a two or three step process, depending on the colors you would like to use. First you will choose the color that will be the bottom layer or background - the color that will be underneath the crackle paste. This is the color that will show through the cracks. For an aged look, you might choose white, black or brown. After you've painted the bottom layer and let it dry, you can apply the Golden Crackle Paste. The crackle paste is white, so you can apply it as-is or mix color into it. Using a palette knife, apply the crackle paste over the surface of your canvas or wood support, making the layer as smooth as possible. You'll have to experiment to determine the optimal thickness of the crackle paste - if it's too thin, the cracks will be barely noticeable, and if it's too thick, it may take several days to dry. Around 1/8" thickness is recommended. In any case, the thicker the paste, the deeper the cracks - so ultimately the thickness depends on the look you are going for. For this reason, I'd recommend doing some small tests with the Golden Crackle Paste before you apply it to an entire canvas or wood support. For instance, you can test it by applying a layer of Golden Crackle Paste to 3 small canvases or small wooden supports. Apply a thick layer onto 1 small canvas, a medium layer on another small canvas, and a thin layer on a third small canvas. Let them dry overnight and then assess the results. As the paste dries, it should crack, creating the crackle effect across your canvas. The dried layer of Golden Crackle Paste is very absorbent, so you can paint washes of color over top of it, if desired. Watery washes of color are preferred over thick applications of paint, because the washes will best accentuate the crackle look. There are also some other crackle mediums you can try, but they've been getting mixed reviews. One of them is Jo Sonja's Crackle Medium, but some say that Jo Sonja's Crackle Medium doesn't really crackle very much. Another brand you could try is DecoArt Weathered Crackling Medium. DecoArt Weathered Crackling Medium can be used to create small cracks (as opposed to the thicker cracks that can be achieved with Golden Crackle Paste). When using DecoArt Weathered Crackling Medium, the instructions are basically the same as described above, except you'll use a brush to brush on the crackling medium. If you live in the UK, you could try a product called Reeves Crackle Spray, which is similar to the mediums and pastes described above, except it comes in a spray form. When finished with your painting, varnish your painting to both protect your work and achieve a smooth finish. Hope that helps and Happy Crackling!